It comes amid ongoing controversy about the mass grave at the site of a former Bon Secours mother and baby home. 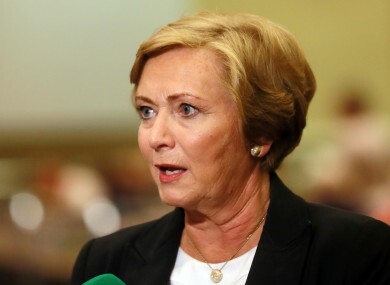 THE MINISTER FOR JUSTICE Frances Fitzgerald has confirmed she has ordered a report from An Garda Siochána to establish how much information it holds about the ‘Tuam babies’ revelations. It comes amid ongoing controversy about the mass grave at the site of a former Bon Secours mother and baby home. Fitzgerald has requested a report from An Garda Síochána on the information available to them to date. There have been calls for the area to be declared a crime scene and for a full public inquiry into how 796 infants may have been buried in an unmarked grave that was later used as a septic tank in the Galway town. The government has already ordered an interdepartmental review to work out how best to proceed with investigating the matter further. Fitzgerald has confirmed that the Department of Justice has been liaising with the gardaí as part of the interdepartmental review. Although she confirmed she had asked for the report, the ordering of which was first reported by TheJournal.ie on Wednesday, Fitzgerald said that decisions about any criminal investigation will be up to the gardaí. “The purpose of criminal investigations is to lead to the prosecution of persons where the commission of offences has been established,” she said. In the Dáil last night, the Children’s Minister Charlie Flanagan announced that a task force will carry out the interdepartmental review and report by the end of the month on how best to proceed. Email “Frances Fitzgerald confirms she has ordered a garda report into the Tuam babies revelations”. Feedback on “Frances Fitzgerald confirms she has ordered a garda report into the Tuam babies revelations”.